We provide emergency shelter to families with children. 70% of families exiting shelter move to permanent or transitional housing. 90% of families in our Aftercare Program remain in permanent housing. Family Promise volunteers amass 10,180 hours per year, providing 3,280 nights of shelter and serving 9,825 meals. Transforming the lives of homeless families. If your family is in need of shelter, please contact centralized intake at 515-248-1850. Download a copy of our 2017 Annual Report! 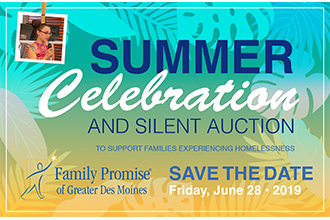 Save-the-date for the 2019 Summer Celebration! Good food, great friends and a silent auction to raise funds for families experiencing homelessness. Check back for tickets! Each night in Polk County, more than 400 adults and children in families are homeless; half are children. The impact of losing a home is traumatic, especially for children. The resulting instability creates insecurity, worry, low self-esteem, and difficulty focusing in school and studying. 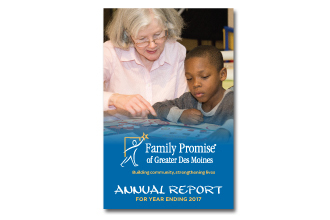 At Family Promise of Greater Des Moines we strive to create a safe, stable and nurturing environment for the children as well as to support the efforts of their parents in securing employment and housing. We partner with 14 host congregations, volunteers and donors to help homeless families with children find steady income and stable housing. Note: The offices of FPGD are located within Westminster Presbyterian Church.